Were you under the impression that savvy marketers use SMS Marketing just to promote their products or deals with a plain “Grab the deal before it expires” tag? You are sadly mistaken. Marketers around the world have realised the potential of SMS Marketing in converting customers. A 160-characters media plan can reap humongous results in a multi-channel marketing strategy. Why? Because it is sharp, targeted and customers have willingly opted-in to hear from you! SMS Marketing is one of the best things that have happened to the industry. I mean, think about this. You can reach your customers, 24/7, at a single touch, and anywhere! Of course, the risk of getting spammed is always present unless you keep your outgoing texts in check. According to Techipedia, 98% of SMS messages sent are opened, and 83% of them are opened within 3 minutes. That not only shows the opportunity behind texting as a communications medium but also how crucial it is to get it right — because you’re talking with people in a medium they clearly find extremely important. Customers treat SMS as deeply personal. So a simple request – “Hi Dave, get 50% off of your next meal when you show this message!” – can get terrific response rates. It’s an effective way to keep your lists of users up-to-date and honest, saving on admin costs and white mail. SMS marketing packs a bunch of awesome features that lets you communicate to your audience with a focused messaging strategy. And how you can use them? Keep your customers updated on their orders or the upcoming events. SMS alerts and reminders, reinforce the importance of your brand. Including URLs encourages subscriptions which can eventually be made into a conversion. Furthermore, your total customer view will be improved through incorporating SMS into your email and e-commerce sale as it allows you to track the customer’s activity back to the SMS. How are brands Using SMS Marketing? Top notch brands are using SMS marketing on full throttle to reflect their brand persona through the SMSes they send out. Taking a leaf out of their marketing book, here are some of the fresh brands who are getting SMS Marketing right to the T.
This is just the second year and Comic Con is already making fans go crazy waiting for the next year to come. For ardent pop culture followers, comic con sure knows how to keep them hooked. 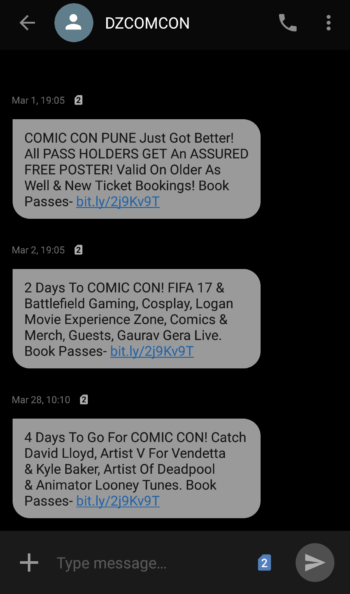 Just a month before the event, Comic Con started sending out teaser texts telling their followers about various offers and about the event on the whole. Check out the texts below. Swiggy has made life easy for all those of us who love food and just don’t have the time to cook or go to a restaurant. They have managed to capture their customers’ loyalty through their live SMS order tracking services and plenty of offers! Check out some below. 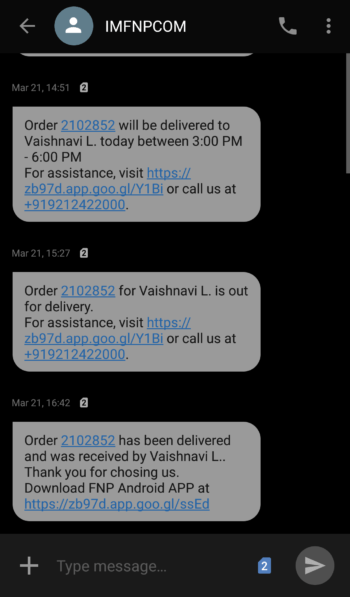 Popular gifting brand Ferns and Petals have taken live order tracking to a whole new level. 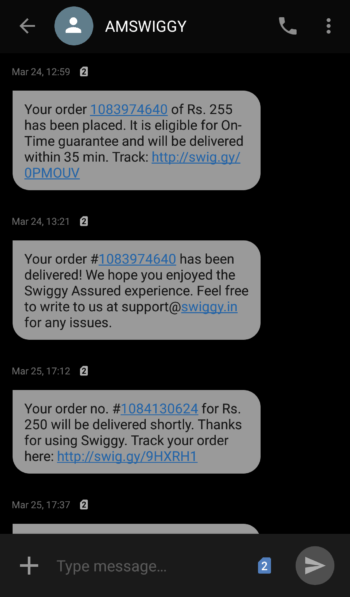 Using well-crafted, personalised SMSes, FnP keeps you updated about the status of your order supported with the order link, and the customer service, incase of any loss. SMS Marketing is a valuable addition to Digital Marketing for brands. While popular brands have added it on to their promotion bandwagon, for rising brands SMS serves as a fast outreach channel.